If you haven’t been to the Deepdale Christmas Market before, then you might well be surprised that the small village of Burnham Deepdale, with about 30 permanent residents, becomes home to one of the East of England’s best festive markets. Stalls are housed in 3 large marquees around the Dalegate Market site, in the Brick Barn of Deepdale Farm, the backpackers courtyard of Deepdale Backpackers & Camping, and amongst the pews of St Mary’s Church. There is FREE entry to the whole event, leaving your wallets free to enjoy your purchases of presents, decorations, food and drink. Car parking is also FREE in the farm yard and fields of Deepdale Farm, please follow the directions of the signage and the car parking team. With over 120 stalls this year, there’s a wide range of products. Mulled wine, biscotti, soaps, chutneys, jewellery, glass, photographs, homewares, charcuterie, cards, tea, chocolate, socks, hats, beer, posh pop, art, cushions, scarves, bags, brownies, jam, liqueurs, wine, pottery, wool, decorations, beard oil, origami, gluten free food, wreaths, toys, saffron, cheese, outdoor clothing, paper, felt, chocolate, wood, fudge, sloe gin, willow, reindeers, clothing, furniture, dog toys, hot drinks, pizza, crepes, Lego, dog coats, cider, forged items and more … Plenty to choose from. The market is open from 12noon to 7pm on Friday 2nd December, then 10am to 4pm on both Saturday 3rd and Sunday 4th December. There is entertainment throughout the weekend, in four locations around the site – Dalegate Stage, Orchard Stage, Backpackers Stage and in St Mary’s Church. Singers, groups, choirs, wish tree, church service, and the very special addition for 2016, Christmas Jumper Flash Mob in the Backpackers Courtyard at 2.30pm on Saturday 3rd. 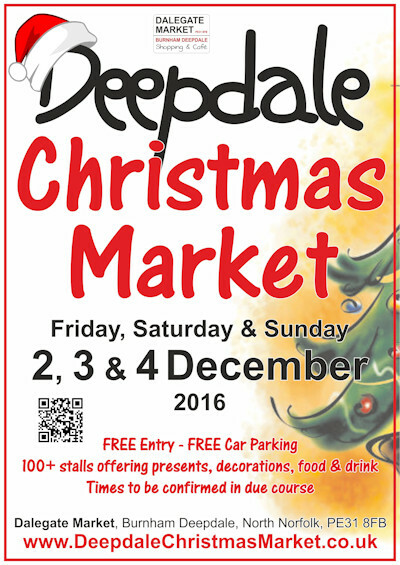 The artisans, producers, Dalegate Market, Deepdale Backpackers & Camping, Deepdale Farm and St Mary’s Church all look forward to welcoming visitors throughout the weekend, for what should be a wonderful celebration of Christmas.